It seems like Judd Apatow is in awe of Jim Carrey's comedic genius. According to The Hollywood Reporter, Director Judd Apatow praised star Jim Carrey on Friday while presenting the actor with the Generation Award at the Just For Laughs festival in Montreal. He said, "He would go on stage every night and improvise his entire set. His goal was not to repeat one line from any other night. It was the funniest thing I've ever seen in my life." The director also revealed that Carrey asked a young Apatow, then a relative unknown and often between gigs, to co-write comedy sketches, and gave him 5000 USD for the work he did. "That paid my rent for about a year," noted Apatow. 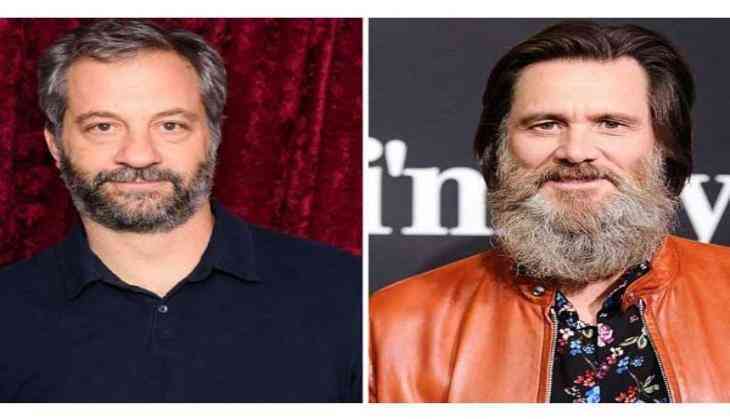 For his part, Carrey, when accepting his award, recalled first meeting a young "fresh-faced" Apatow as he introduced himself backstage at The Improv. "He said to me, 'Hi Mr Carrey, I'm a young comedian. My name is Judd Apatow," Carrey remembered. With his unique style, Carrey responded by saying, "F*** off narc!" "So I said, okay. And I made him do heroin with me. I'm not into drugs, but I had to make sure I knew who I was dealing with," shared the three-time Golden Globe-winning actor. Carrey is a co-executive producer on Showtime's 'I'm Dying Up Here,' and also appeared this week at Just For Laughs with the series' cast.